In/Near North Carolina? You are invited! You are cordially invited to discover America through the eyes of its first peoples via the First American: Voices Film Series, a joint effort between Lenoir-Rhyne College and the Women's Resource Center. Both events are free and open to the public. At 6:30pm, see a performance by the All Nations Drum and Performers of Cherokee, NC. At 7pm, see a screening of Four Sheets to the Wind. This Native-produced film had its world premiere at the 2007 Sundance Film Festival, where Tamara Podemski (Saulteaux) won the Special Jury Award for Acting. Director Sterlin Harjo (Seminole/Creek) is a Sundance Institute Annenberg Fellow and a 2006 Renew Media Fellow. Producer Chad Burris (Chickasaw) has been a selected to participate in Sundance Institute's Producers Lab. This film follows the drama of one family living in contemporary Native America and is rated R.
At 6:30pm, see a presentation by Dr. Amy H. Sturgis, who will be signing copies of her book, The Trail of Tears and Indian Removal, at the end of the event. 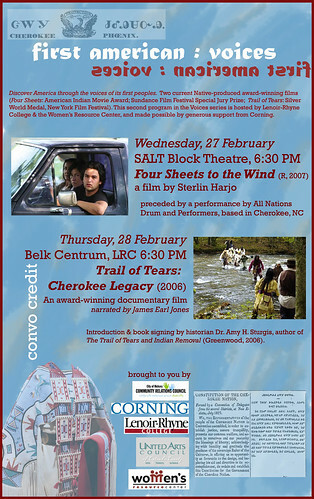 At 7pm, see a screening of The Trail of Tears: Cherokee Legacy. This Native-produced documentary is endorsed both by the Eastern Band of Cherokees and by the Cherokee Nation of Oklahoma. It is presented by Wes Studi (Cherokee), and it has won an impressive array of awards, including the Silver World Medal for History (New York Festivals, 2007), the Silver Film Award (Telly Awards, 2007), Best Documentary (American Indian Film Festival, 2006), the Founder’s Award (International Cherokee Film Festival, 2006), and Best Feature Documentary (Native American Music Awards, 2007), among others. For more information, see the Voices Film Series blog. Check back for additional updates! Oh, that sounds cool! I wish I could take the time off and go but it is a little bit far for a short trip. Oh, I got a couple of the Mystery adaptations of the Tony Hillerman books from the library and watched them. They were quite good and I couldn't help but think that Adam Beach and Wes Studi would make a much better Ged and Ogion than we saw in that stupid mini-series. Anyway, they were excellent in the mysteries. Thank you so much! I just adore Wes Studi. He grew up not far from where I did, and he's done a great deal to help Cherokee theater. His role as host in this documentary is especially well done; he narrates in Cherokee/Tsalagi (his original language - he didn't learn English until he went to school) with English subtitles. I love those Hillerman Mystery dramas. I'd never ever thought of Adam Beach and Wes Studi as Ged and Ogion before. That's brilliant!!! Absolutely perfect. I want to go raise money now for that adaptation. :) (We need a new one to help us forget that mini-series, anyway! LOL.) They play father and son in the new Comanche Moon film (the latest incarnation of Lonesome Dove), but I haven't seen it yet. I've heard the writing isn't the best, but hey, I have to see it just for them. I must try to find that documentary. Sounds interesting. Yes, Studi is brilliant. I didn't know English wasn't his first language! Cool. Yes, I'll help raise money for a new Earthsea adaptation! One of my favorite mental games is "the casting game," where I think about who I would cast in a film adaptation of a book I like. I'd love to be a casting director. I hope it goes really well though! Sounds wonderful. But I'm not going to be down that way so I'll have to content myself with echoing the good wishes of all the others who are too far! Thank you so much! :) Good wishes are much appreciated. Sounds cool! Alas that we are not in NC. I'm very excited about this work, Amy, and wish I could be there. Last week our friend Dr. Suuqiina spoke at our church (he & his wife Qaumaniq live in Tennessee but are actually members of our little parish); he was out to do some teaching and speaking and wind his way up to Montana the Northern Cheyenne & local government (prudence probably requires me to be oblique here--) sitting down together at table to talk and look at reconciliation... that would be a big deal. Wow, that would be a big deal! I wish them the very best.